Too many times we believe that things like shrillness, dominance, volume and agression mark the good debater, the solid argument and the one who can shape social opinion. The other part of that misconception is that civility represets a kind of weakness. It is supposed that the argument made civilly is a missed opportunity. 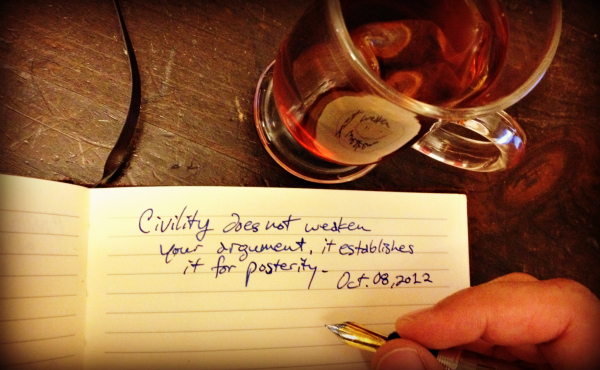 Civility is not a weakness, but a strength for the longer term. When you or I are able to express and share our thoughts in a civil manner we establish those thoughts on a foundation that can last. We all want to be heard, but not at the expense of being heard well. Incivility is a short cut that doesn’t pay off. Incivility can and often does bully itself onto the stage of public discourse and seems to have an audience, but it doesn’t last, it has no solid foundation. We should let civility shape our discourse so that posterity will be able to continue to hear, to use and to righty judge the substance of our thought. This entry was posted in October 2012 Civility and tagged Civility, discourse, foundation, future, history, posterity.